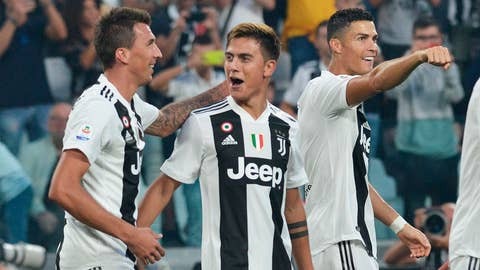 Mandzukic has four goals in six appearances — he scored only five in 32 league games last season — and is working well with Ronaldo in a three-pronged attack, with Paulo Dybala dropping back. While Mandzukic struggled to find the back of the net in Serie A last season, he did net four goals in six Champions League appearances. Juventus will be looking to him for goals in that same competition on Tuesday when it hosts Young Boys, with Ronaldo suspended following his red card against Valencia. “There will be no Cristiano and we know how important he is for us, but this is a team sport. There are 11 of us out there,” Juventus midfielder Rodrigo Bentancur said. Juventus CEO and director general Giuseppe Marotta surprised many when he announced on live TV on Saturday that he will not be nominated for another term as CEO at the club’s Oct. 25 board meeting. Marotta’s market moves have been an important part of Juve’s run of seven straight Serie A titles. He joined the Bianconeri from Sampdoria in 2010. While Marotta will remain director general for the time being, Juventus vice president Pavel Nedved and sporting director Fabio Paratici are expected to be given more power. There is also speculation that Zinedine Zidane, a former Juventus standout like Nedved, will join the Turin club’s management. Marotta is being tipped for a move to Napoli or Roma. After Francesco Totti and Daniele De Rossi, Lorenzo Pellegrini is building his credentials as Roma’s next Rome-born fixture. Coming on as an early substitute, the 22-year-old Pellegrini scored a backheel goal and set up Roma’s two other goals in the 3-1 victory over Lazio in the Rome derby on Saturday. Nicknamed “Lorenzo the Magnificent,” Pellegrini grew up in the Cinecitta neighborhood of Rome — near the famous cinema studios — and spent his youth career at Roma. Roma then sold Pellegrini to Sassuolo in 2015 but with a buy-back clause that enabled the Giallorossi to re-purchase him last year. While Pellegrini played in nearly 40 matches for Roma last season, he had a difficult start to this campaign and was harshly criticized by fans. Lautaro Martinez capped a man-of-the-match performance with his first goal for Inter Milan on Saturday — with his first attempt in Serie A. He struck in the 12th minute to send Inter on its way to a 2-0 victory over Cagliari. The Argentine, who turned 21 last month, joined Inter from Racing Club in the offseason and Inter coach Luciano Spalletti believes working with compatriot Mauro Icardi has seen him progress.